I haven't seen any pricing yet for the China Glaze Magnetix Collection, and I just spotted the information below on Drugstorenews.com. According to the news release, it states that the polishes will retail for $10.00 each, and that the magnets are sold separately for $10.00. It's written in such a way that I'm not certain if the magnets are $10.00 each, or $10.00 for all 3 patterns. Probably $10.00 each, wouldn't you think? But then again, when I look closely at the promo picture, the boxes in the front center of the display look like they could hold 3 magnets. I do like that China Glaze is offering 3 different patterns though. These will be available mid-February. For reference, Nails Inc. runs $16.00 and includes the magnet, Layla runs $15.50 and also includes the magnet, and LCN runs $9.95 for the polish and $19.95 for the magnet. 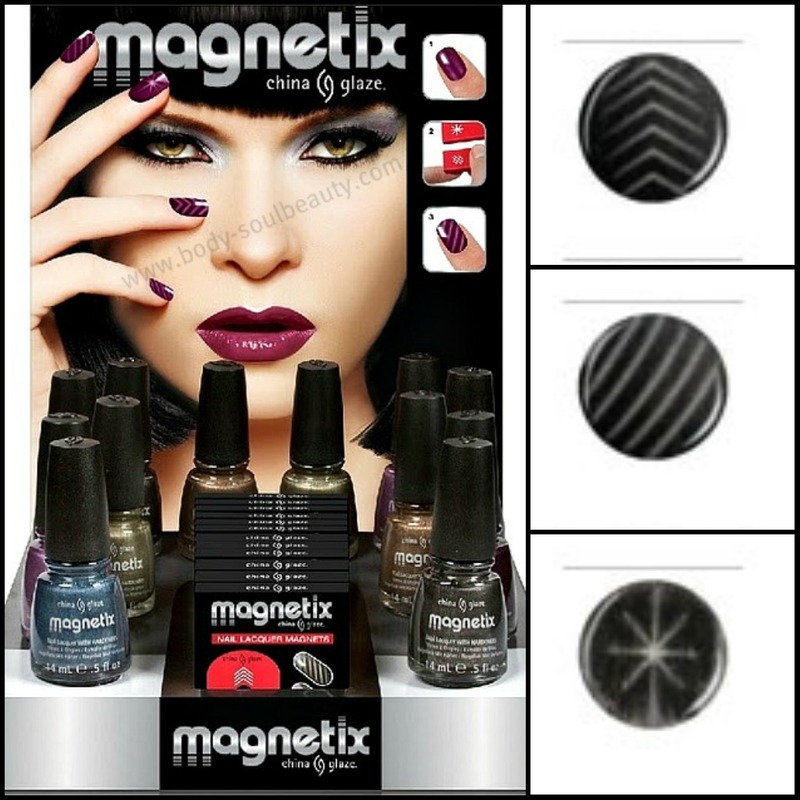 LOS ANGELES — China Glaze, which makes nail lacquers sold at salons and professional beauty supply stores nationwide, has announced the launch of its limited edition Magnetix nail lacquer collection. The package of the magnets also says magnets, so I am guessing it holds all 3 patterns. I do think they are pricey though! Well crap. I was hoping this polish would be affordable...I just have a problem paying $20 for a novelty item that will probably only be worn a few times. Maybe the polish is just really pricey to product. In any case, I may be jumping the gun on this, but I was really hoping it would be in the $10 for a set of polish with a magnet. Cling-On! What a cute name! When did magnets get so expensive? Last time I checked, I could buy a refrigerator magnet for less than $3, so I don't understand why a nail magnet would be $10. Having said that, I'm not really a fan of the magnetic polish trend, so I doubt I'll be buying these. PRICEY.I noticed the package says magnets so all three, excited about it so this I look forward to these.Perhaps will splurge and buy them all sound LE hope the etailers get em..save a dollar or 2. That's expensive for China Glaze. I only expected to buy a few, but at $10 a bottle, plus a $10 magnet, I doubt I'll even be doing that. They cost as much as the other brands and I was so hoping these would be a cheap alternative. Maybe it's just an expensive product to make in general, who knows, but totally not what I expected. Hmm....a bit more expensive than I had hoped, but they have a chevron pattern! It's still less than Nails Inc. or Layla too :D Thanks for posting this! I like the looks of the green. I always like greens. These are going to be expensive. I'm sure they'll be a big hit. I might buy one. I do own one Nail, Inc. magnetic polish. I could use the polish from that. Even *if* it's 10 per magnet, it's still good. I really only want the star anyway, I can use my line magnet from my nails Inc.
IMO I much prefer Nails Inc over Layla--I've only swatched one of each, but the Nails inc was PERFECT and it was cool to see the design appear like magic! I was not as impressed with the Layla, the design was just ok. Going to try the nails inc magnet on it and see. Plus I like the design of their magnet (detachable) over layla's. I'm glad that CG's will be separate as well! I am interested to see these in person when it comes out. I'll wait for swatches. I don't have any magnetics and haven't really wanted any cause of the price mostly. I will probably only get it with coupons on separate purchases. But i do that anyway! Ulta will sell them and usually I can get a coupon for $3.50 off $10. Yay!! A variety of different fridge magnets leave unique patterns as well. The China Glaze magnet is horse shoe shaped. It has 1 pattern on each end and 1 at the top center. The magnet is not very strong. The nail techs that work for me could not get it to work on several colors - Instant Chemistry, Drawn To You, and Cling On. We tried several techniques and it is just a poor quality magnet. Hope this helps.